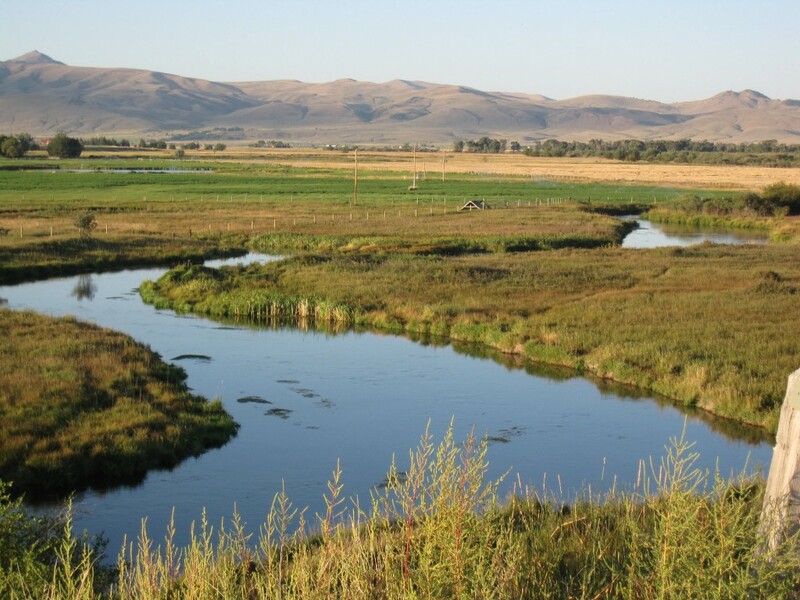 The Beaverhead Watershed Committee has been working with landowners, Montana Fish, Wildlife & Parks, the Dillon Canal Company and various other partners on the Poindexter Slough Fishery Enhancement project. Poindexter Slough is one of the few publicly accessible spring creeks in southwest Montana. We feel it’s important that the public have the opportunity to fish in a clean healthy slough. The goal of the project is to enhance public fishing opportunities by creating a narrower stream channel that will be able to clean sediment out. Through grants and generous private donations the Beaverhead Watershed Committee completed all of the irrigation infrastructure improvements and a significant amount of the in-stream habitat work (2.6 miles!) in early 2015. In 2016 an additional 1.6 miles of in-stream habitat work was completed. The final phase of habitat enhancement for the lower 0.5 mile of channel downstream of the Dillon Canal to the Beaverhead River was completed in the spring of 2018. The purpose of the project was to improve the quality of Poindexter Slough, a unique spring creek-type fishery occurring primarily on public lands 3 miles south of Dillon, MT. For over a decade Poindexter Slough has seen a dramatic increase in sediment and with that a steady decline in fish habitat and use. The reported angler use went from over 4,000 angler days to 610 angler days and average angler satisfaction rating transitioned from “excellent” to “poor”. Improving the habitat in Poindexter Slough is beneficial to not only anglers but also to the local economy and businesses. During periods of high angler use it is estimated that over $433,000 of direct expenditures are made annually in Beaverhead County by anglers fishing Poindexter Slough. To enhance the fishery modifications were made to the irrigation infrastructure and channel dimensions were modified to effectively convey fine sediment and maintain pool habitat using designed flushing flows. History and Location: Poindexter Slough is a 4.7-mile long valley-bottom channel of the Beaverhead River fed by a combination of groundwater and flow from the Beaverhead River. The lower 3.2 miles are located on a FWP Fishing Access Site and provide one of the few publically accessible spring creek angling experiences in southwest Montana. Poindexter Slough was traditionally fed largely by groundwater returning from flood irrigation. These “spring” sources were adequate to meet the irrigation demands of the Dillon Canal, which diverts its water right about half way down the slough, and create a very productive and stable spring creek fishery. As pivots replaced flood irrigation, groundwater inputs decreased and Poindexter Slough was supplemented with increasingly more water from the Beaverhead River in order to meet the Dillon Canal’s water right. Diverted Beaverhead River water carries and deposits a large amount of fine sediment into Poindexter Slough. Because Poindexter Slough is a relict Beaverhead River channel, it’s dimensions required relatively large flows of up to 500 cfs to most effectively mobilize and flush fine sediments from pools and riffles in some reaches. The previous infrastructure allowed a maximum of only about 50 cfs to be diverted from the Beaverhead River in addition to the up to 25 cfs of groundwater flows Poindexter Slough gains over its length. A 2,000 foot reach of stream that was backwatered by the Dillon Canal diversion further degraded habitat and complicated sediment transport in Poindexter Slough. A pin-and-plank diversion structure was used to raise water surface elevation several feet to serve an adjacent landowner’s irrigation pump and feed the Dillon Canal. This structure resulted in seasonal creation of a small impoundment, which inundated 2,000 feet of stream habitat and captured sediment throughout the irrigation season. Following irrigation, the boards were removed and the stream recolonized a channel, resulting in relatively low quality habitat in the previously backwatered reach and transport of the sediment trapped there downstream. Additionally, the diversion structure served as a seasonal barrier to upstream fish movements. In order to effectively mobilize and transport fine sediment and restore better habitat conditions, infrastructure to accommodate a flushing flow and eliminate backwatering caused by an irrigation diversion is required. Adequate flushing flows can be achieved throughout Poindexter Slough by a combination of increasing the size of the Beaverhead River head gate and selectively narrowing the channel in lower reaches. This alternative seeks to employ an active approach to channel enhancement by increasing the quantity and depth of pool habitat, restoring appropriate width-to-depth ratios for riffles and pools, removing or isolating fine sediment deposits from the stream bed, and encouraging natural recruitment of willows and other woody riparian vegetation. A new head gate would be installed at the top of Poindexter Slough to route flushing flows of adequate magnitude and duration to mobilize and transport sediment through the slough and maintain and rejuvenate restored habitat features. To permanently eliminate backwatering and the barrier to fish movement, the Dillon Canal would be re-graded and its pin-and-plank control structure and head gate would be lowered in elevation. A flow management plan that describes desired magnitude and duration of flushing flows required to mobilize various sized particles has been developed and a new grazing management plan would be implemented to promote recruitment of woody riparian vegetation on private land. This project will enhance wild fish habitat, adult fish abundances, and improve angling quality on Poindexter Slough.